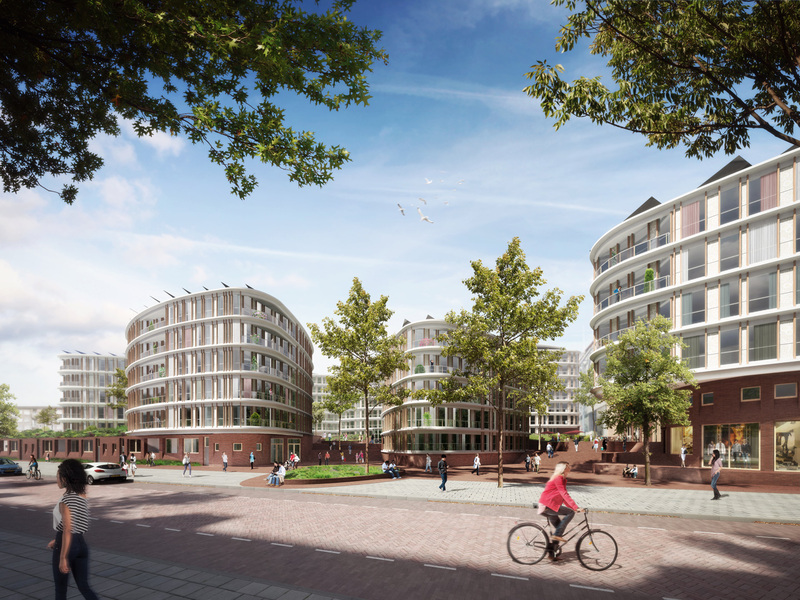 Rhapsody in West is a special residential project in a special location in Amsterdam (Bos en Lommer). The Jan van Schaffelaarplantsoen is a noisy place along the A10 highway, on the edge of the Kolenkitbuurt. This undeveloped site had for a long time an important function for the neighborhood as green space and meeting place. It is precisely here that a substantial program of housing needed to be developed. 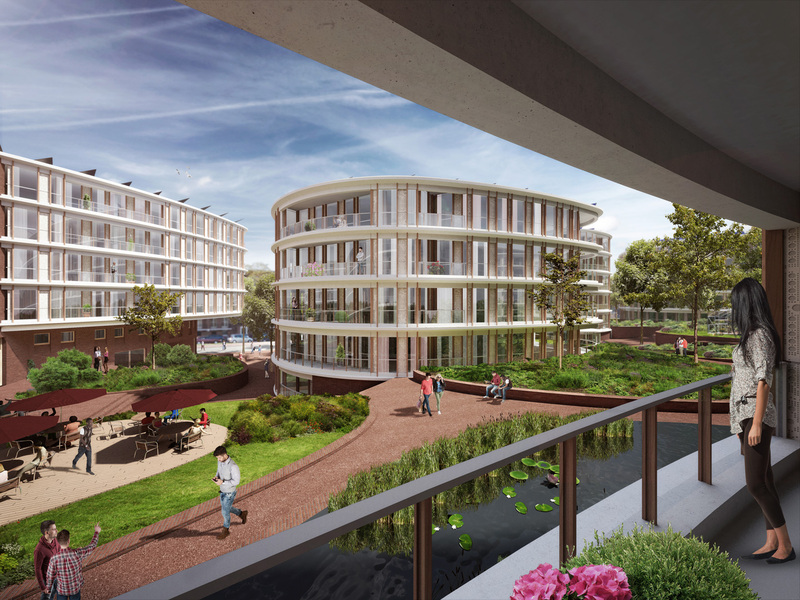 A difficult task that has been achieved through a unique collaboration between designers, builder, investor, municipality and local residents. Tangram took the initiative for Rhapsody in West together with Urban sync. Artist collective Cascoland represented the neighborhood. 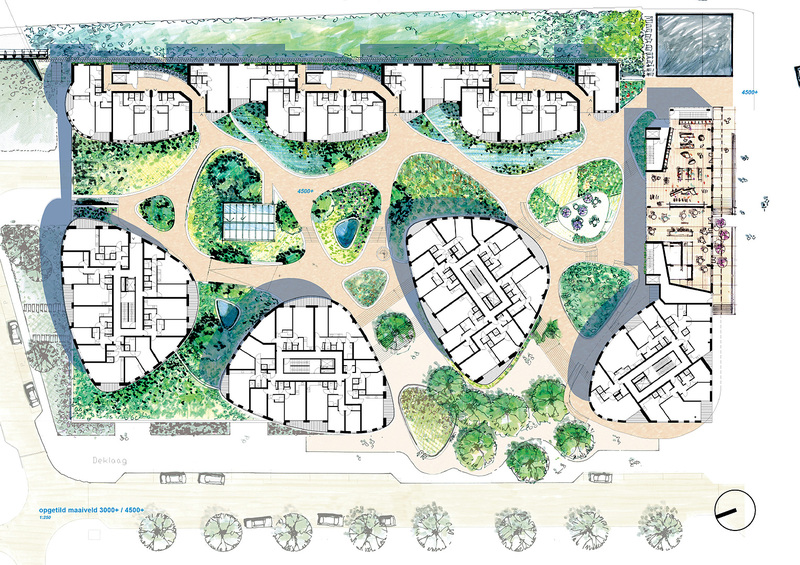 The project combines a high building density with plenty of room for green and water. Furthermore, it is a meeting place for the neighborhood. 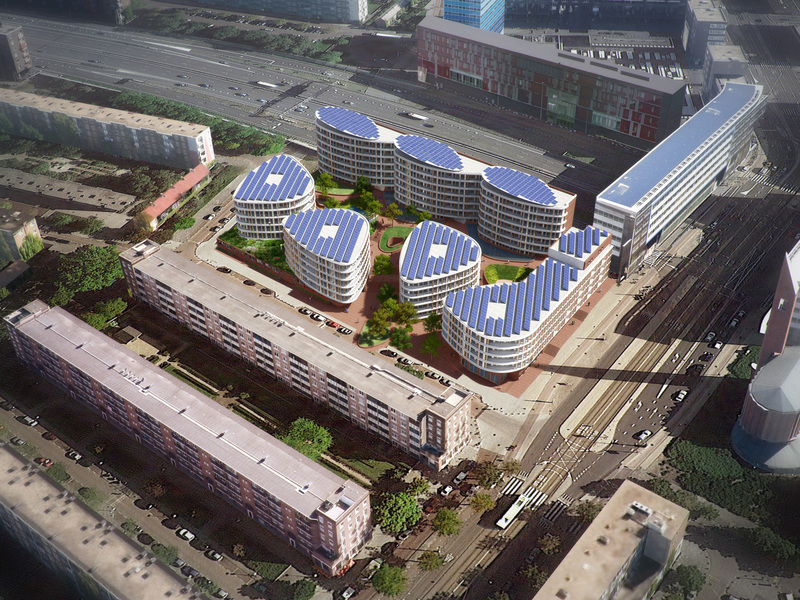 The special round shapes of the blocks contribute to the compactness of the plan. They also bend the sound of the highway so that no noise barriers are needed on the side of the A10. By making use of the height difference to the bridge over the A10, space is created for hiding parking, storage and water buffering. The open allotment on the neighborhood side creates ‘air’ between the building blocks, making the residential complex look inviting. Noteworthy is the extremely good energy performance with a negative EPC (- 0.15!). The whole complex is a large energy factory. The residents supply energy to the grid after deducting their own use. This is due to various measures, including solar cells that partly rotate with the sun and thus greatly increase the yield.